After the Second World War, during which many millions were systematically, industrially, gruesomely murdered in the worst genocidal crime against humanity, the earnest, global, unison cry was, ‘Never again’. Those two words summed up the sincere, solemn feeling and resolve of a world shocked, numbed and reeling from the discovery that so many had been so callously rounded up and brutally murdered. Not for anything they had done. But simply for who they were. Mostly Jews, but also gypsies, homosexuals, the disabled…and others, many others. Millions. Murdered. With the goal to wipe them out. Men, women, children, babies. Mass murdered. Destroyed. Deleted. Never again. That was the response. Never again. Never again. The means to achieve this noble intention was set in motion immediately. The United Nations came into existence just 51 days after the World War came to an end – 24 October 1945. Its goal? To maintain international peace and security and to promote respect for human rights, aided by the jurisdiction of the newly formed International Court of Justice. One of the United Nation’s first tasks was to create the 'Universal Declaration of Human Rights' – described as the “international Magna Carta for all mankind.” It came into existence on 10 December 1948. The Declaration unequivocally proclaimed the inherent rights of all human beings – all of them, all of us; every human; you, me, everyone; universally, and without exception. The Declaration has been translated into more languages than any other document, and ratified by 130 countries. Alongside this international declaration of principle, Britain’s war time leader, Winston Churchill, passionately promoted the 'European Charter of Human Rights’ - the world’s first international treaty to legally protect human rights on the continent of Europe. "We aim at the eventual participation of all the peoples throughout the continent whose society and way of life are in accord with the Charter of Human Rights." British lawyers drafted what was later to become the 'European Convention on Human Rights'. The UK was the first country to sign up to it on 4 November 1950, and the Convention came into force on 3 September 1953. Including Britain, 47 countries agreed to the Convention, which provides civil and political rights for all citizens, enshrined in law and overseen by the European Court of Human Rights. Europe, in particular, had to change its ways. That’s where the planet’s two world wars originated. Right here, in Europe. In direct response, the continent needed to be united. Never again should the countries of Europe go to war to resolve their differences. Never again. The European Coal and Steel Community - later to be become the European Economic Community and then later to be called the European Union – was established in 1951 with the express intent of avoiding wars in Europe again. Trade was to be the means; peace was to be the ends. In direct response to the most horrific war and genocide the planet had ever known, the world rallied to find a way forward so that such wicked crimes against humanity could never happen again. The United Nations. The International Court of Justice. The Universal Declaration of Human Rights. The European Convention on Human Rights. The European Union. All established in direct reply to the war, and all to achieve the same aim: peace. This was the resolve of those who endured and survived the terrible atrocities of the fascist regimes that blighted the planet during the long years of war and madness. Never again. Those were the words of our parents, our grandparents, our great grandparents. That was the intent of the planet’s leaders following the eventual crushing of the world’s barbarous enemies. Never again. Fine words. But utterly meaningless unless enforced. Since the end of the war the words ‘never again’ have been cast in stone and stamped on our memories. But the atrocities that the post-war generation so sincerely wanted to prevent happening again, have happened again. And again. Churchill described the mass murders in the Nazi death camps as ‘a crime without a name’. But it now has a name. It’s genocide. And it's a name that’s in frequent use because it’s a crime that’s frequently committed. Too many to list them all.. The genocide of millions of non-Arabs in Sudan’s on-off civil wars since 1955.. The photo accompanying this article shows the memorial stone at the site of the Nazi extermination camp based in Treblinka, Poland – one of over 40,000 death camps and incarceration centres purposely built to mass-murder or enslave millions of people during Hitler’s regime. I drove to Treblinka in 1991. It was one of the most desolate, moving experiences of my life. It was dusk and I was there all alone. I wanted to write ‘not another soul’. But all around me I could feel hanging in the air and deep in the ground the souls of the estimated 900,000 innocent people, who had been methodically and efficiently slaughtered in the camp’s six gas chambers. There was a sinister silence all around. This was a most evil, awful place, and always will be. The Nazis, in an attempt to avoid responsibility for their crimes, hastily destroyed much of the camp as they retreated from the advance of the 'liberating' Russian Red Army. Today, the site of the camp, in a bare, bleak, clearing in the middle of a huge, menacing wood, is punctuated with hundreds of shards of rock, carefully placed in memory of the victims. I prayed for them before driving away. As darkness began to fall, I got completely lost trying to navigate the road leading from the camp, in the middle of the never-ending dense woods, through which light could barely penetrate, and it seemed didn't want to either. There were no other cars on the road, no street lighting, no signs, no satnav. For a long while I thought I’d never find a way out of there, and if I did, I never, ever wanted to go back. But at least I can live to say that. 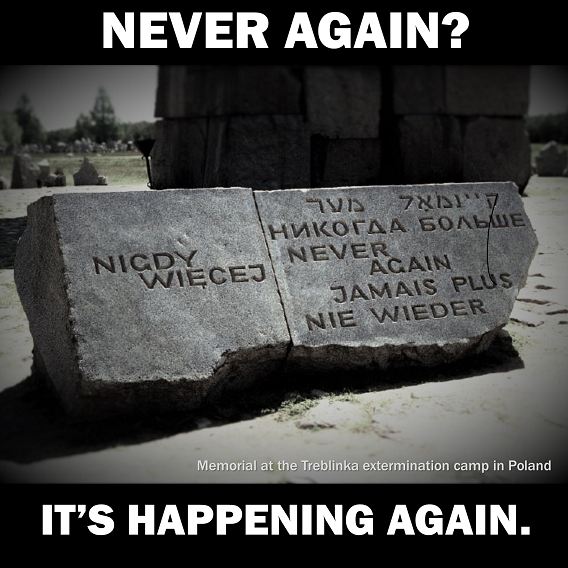 The memorial stone at Treblinka pleads in more than one language, ‘Never again’. But just one year after my 1991 trip, civil war started in Bosnia, in the former Yugoslavia. In just one town of Srebrenica during just one month, in July 1995, over 7,000 Muslim men and boys along with 25,000-30,000 refugees were ruthlessly killed. This happened, despite the town being officially declared by the United Nations as a “safe haven” and patrolled by 400 Dutch peacekeepers. The Srebrenica massacre is considered to be one of the greatest failures of the United Nations. It has been ruled to be genocide by the International Criminal Tribunal for the Former Yugoslavia. And today? Yes, today it’s happening again. Today’s news is that the United States – somewhat belatedly – now confirms that Islamic State, also known as Daesh, is committing genocide against many thousands of Yazidis, Christians and Shiite Muslims in the Middle East. America’s formal designation comes days after the US House of Representatives passed a non-binding resolution by a 393-0 vote condemning ISIS atrocities as genocide. “The fact is that Daesh kills Christians because they are Christians; Yezidis because they are Yezidis; Shia because they are Shia... Its entire worldview is based on eliminating those who do not subscribe to its perverse ideology." It was impossible to know the full scale of the extremists' atrocities, he said. Presidential candidates Hillary Clinton, the former secretary of state, and Republican candidate Ted Cruz have also said they consider the acts genocide. Last month, the European parliament also unanimously backed a resolution to label the atrocities as genocide. The world is currently experiencing the worst refugee crisis since the Second World War, with over 60 million people now displaced by war, violence and oppression. Over half the world's refugees are children. Europe is struggling to cope with the huge numbers of desperate people escaping to its shores, even though they represent just a tiny percentage of the total number refugees. We don’t want to take in any of the refugees who have made it to Europe, and we will only offer safe refuge here to a tiny few from the refugee camps nearer to the zones of conflict. Some papers and politicians are callously claiming that people fleeing from war and conflict aren't even genuine refugees. Our time and energy are being absorbed and engrossed by a referendum on whether Britain should remain a member of the European Union. Our government has pledged to scrap our Human Rights Act, and is contemplating whether to abandon our 60-year commitment to the European Convention on Human Rights, just as the world needs more human rights, not less. If and when the current global crisis is over, our politicians may no doubt pontificate on today’s horrendous crimes against humanity and declare, ‘Never again’. Yes, never again. Yes, we must say it. But isn't it time we really meant it? The world must act now to end genocide. Britain must play its part - and not turn the other way.